Ten weeks have passed since Carl Icahn announced his investment in Apple on Twitter and certainly a lot has happened since. The initial ‘pop’ added $30 to the stock overnight, not the most dramatic movement in Apple’s share price this year, but certainly one of the better upward ones. To date, Apple’s share price is up 7% since Icahn’s disclosure, albeit in a period when Apple has launched new products. Another boost to the share price came last month, when Icahn toured television studios to report back from his dinner with Apple CEO, Tim Cook. The veteran activist has been lobbying Cook to borrow $150 million to repurchase shares. It’s a tactic often used by activists – Activist Insight data suggest that buybacks have been one of the staples of activist campaigns over the last four years, averaging between 6% and 7% of total objectives each year. Apple itself has been there before. In February 2013, David Einhorn pushed for the company to issue ‘iPref shares’. In the end the company returned $40 million to shareholders through dividends and a repurchased $60 million of shares. 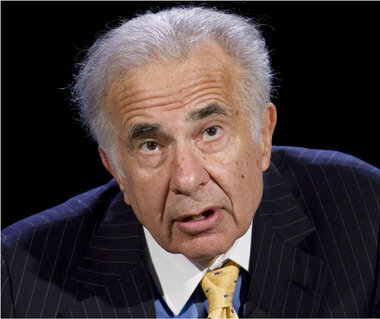 Nonetheless, Icahn is putting his reputation and firepower on the line to push Apple further than it really wants to go. In a public letter to Cook, Icahn wrote of the buyback “While this would certainly be unprecedented because of its size, it is actually appropriate and manageable relative to the size and financial strength of your company. Apple generates more than enough cash flow to service this amount of debt and has $147 billion of cash in the bank.” Icahn says the result would be a 33% boost to the stock price, potentially making the company more valuable than during Steve Jobs’ lifetime. A buyback is one thing, borrowing an amount equal to the company’s cash is quite another. Sure enough, Apple enthusiasts have been queuing up to advise the company on the new services it could provide with that sort of money. Yet the original gentility of Icahn’s approach now seems to be slipping with the launch of his new website, theshareholderssquaretable.com. While still respectful of Cook, Icahn now mutters that Apple doesn’t have financial expertise on his board. Asked if he would run a proxy contest, Icahn paused for a moment, then admitted that he would be open to persuasion from other shareholders. How successful he will be depends on how well he’s made his case so far.